Peter is a whiner and he is driving his mother around the bend with his bad manners. One night, he finds himself transported into the woods with the Whimper-Whineys in Whimper Whineland and discovers that everything in their world is sour and ruined. It is with great relief that Peter wakes in his own bed. Written in rhyme, the tale allows children to reflect on how their behaviour affects not only them but also the world around them. The illustrations cleverly show that Peter's world is one of life and colour whereas Whimper-Whineland is dark and foreboding. 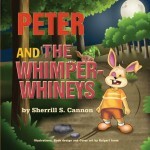 Peter and the Whimper-Whineys has won a Bronze Readers Favorite Award - and is also now available as an App on iTunes, where it can be used as an audio book, regular eBook, and can also record parent and child reading the story. Australians can buy through any online store and the book is printed and shipped from Melbourne.